When it came time to buy an articulated dump truck to service a growing forestry workload, husband and wife team Garry and Tanya Russell had all the information they needed. 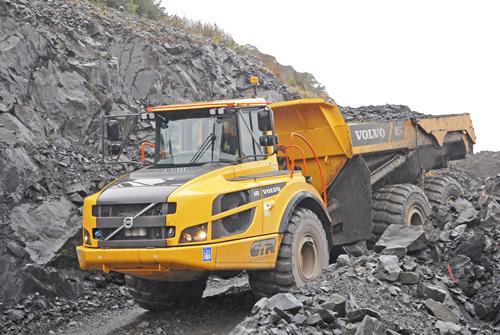 The couple, who run award-winning Dumfries business GTR Contracts Ltd, had already been hiring in Volvos to help satisfy demand and having made the decision to purchase agreed to continue with the same manufacturer and bring on board an A25G. Formed in 2006, GTR specialises in renewable energy projects, agricultural contracting and forest road construction and maintenance. The new A25G has a carrying capacity of 24 tonnes, heaped capacity of 15.6m³ with the optional cantilever tailgate fitted, and runs on low-profile 750/65R25 wheels and tyres. “Having the truck running on flotation tyres is absolutely critical for working on forest roads since the ultra-low ground bearing pressure prevents damage and rutting and lessens the impact on the environment,” Garry added. The truck joins a mixed fleet of plant including excavators, agricultural machinery and specialised equipment including three Volvo graders equipped with Trimble 3D laser scanners. ♦ GTR also operates a haulage fleet and provides a hydraulic hose replacement service in the south. It was voted Outstanding Performing Business at the 2014 Dumfries and Galloway Business awards.